Motorola ATRIX HD MB886 is currently not available in any stores. Front Camera enables you to take your own photos and also you can use videocalling feature (if videocalling is supported in this mobile phone). Watch your favourite video songs and movies in video player. It supports MPEG4, H.263, H.264 file types. Listen to your favourite songs in music player. It supports MP3, AAC, AAC+, WMA, WAV, RA, MIDI etc. file types. Powerful internals, gorgeous screen, solidly built body, and a stock Android experience with just the right amount of modification -that's the Motorola Atrix HD in a nutshell. 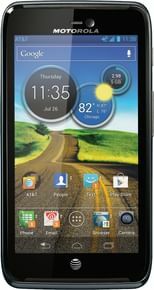 Motorola has addressed the issues of the smartphone's predecessors, thus creating one of the most complete Android packages currently on the US market. The Atrix HD is the best AT&T Android device you can get for under $100, though it doesn't match the One X and Galaxy S III despite having similar specs.